Since 25% of all warehouse injuries occur at the loading dock, warehousing and manufacturing operations need to pay close attention to this area. Shipping and receiving docks both suffer similar problems in that they are bustling places. At peak times they can get very busy, and when people are pressed for time, they become careless. So, what are the common injury types, and what can you do to avoid them? First, you must take on the basics. Make sure your dock workers use personal protective equipment – sturdy work shoes or boots, work gloves, hard hats, ear plugs, eye protection, dust masks, back supports, and climate-appropriate clothing as needed. Everyone should be trained on the dangers present in the dock area, and that training should be refreshed. First aid kits should be positioned close to the dock, and from management to forklift drivers to material handlers or packers, everyone who is involved should know where the first aid equipment is, and how to use it. Shifting trailer loads can fall out on receiving workers or truckers: Even for short hops, a truck load can shift in transit. Pallets can break or slide. Opening the door to a trailer can be dangerous, since a busted pallet could spill if positioned against the trailer door. Be cautious when the truck trailer doors are opened, and that the truck is adequately chocked and restrained. Slip and fall accidents are a major issue: Falls are the most common type of dockworker injury. Don’t let water or oils from a forklift stand on the dock floor, even if it means interrupting a truck unloading or shipping cycle to get the hazard cleaned. Clean them promptly and make sure the floor is adequately dry for safe working conditions (you can also put up temporary hazard cones if space and layout allows). 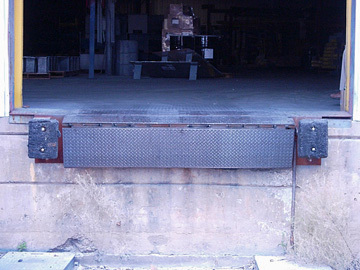 Always be aware of footing on the floor, in the trailers, and on dock plates. Workers can fall from edge of the dock: This happens all too frequently. This kind of accident can result in serious injuries – even fatalities. To address the problem, keep your dock doors closed or barricaded when not in use. If the doors need to remain open, you can add a barricade to them such as a dock safety gate or folding security gate to help prevent falls. Truck drivers can back into workers between the dock and the truck: This practice is extremely dangerous. If a worker must be in the space between the trailer and dock, be sure the driver kills the engine, chocks the truck, and exits. Workers have been crushed by standing inside the dock and hanging outside the door, trying to signal the driver. Don’t let people climb down the dock or hang outside it at all if a truck is present. Even without a truck, allow climbing only using a dock ladder or other safer means. Back injuries are rampant at loading docks: Since workers are typically in a hurry, and are frequently required to lift, it’s natural for back strains and injuries to occur in this area. What can you do to avoid lifting, twisting, bending, or reaching overhead? Are workers trained in proper lifting techniques? Are they rotated through tasks so the same people aren’t always doing the same things? This helps to reduce repetitive motion issues. 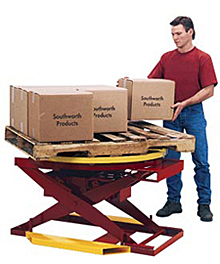 If you are palletizing or de-palletizing near the dock area, consider ergonomic equipment such as pallet positioners, which rotate and adjust vertically to the worker. Remember that back issues are usually a long term problem, not an instant injury. Preventing the kind of abusive repetitive motion that causes injuries will improve these injury rates over time. Forklift drivers are blind when backing out of trailers, and dangerous when the driver is busy: Forklifts are a safety issue anywhere they operate, but they are a specific problem at loading docks. When a driver is inside a trailer, he’s focused on situating his forks and backing onto the dock. Good drivers check their rear view, but on harried days, or if there is a mental lapse, they can and do back into people exiting a trailer. 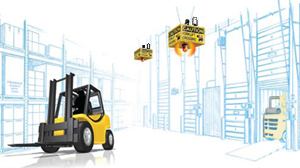 This is where convex mirrors, backing alarms, rear-view mirrors, or shipping dock motion sensors can enhance the safety of your dock operation.The key piece aside from those enhancements is training – both for the drivers and dock workers. Make sure visitors, truckers, and other untrained personnel stay out of the way during these operations (keep them in lounges or waiting areas). Pedestrians should be restricted to clearly marked lanes during this time; install guard rails if necessary – it is inexpensive and can save lives. They should understand that forklifts steer from the rear, and to pay attention to the back end of the forklift as it turns. This is another place to emphasize visible safety vests and other clothing that helps drivers see pedestrians. Also, keep pedestrians out of trailers when forklifts are present: If someone needs to go inside the trailer, back the forklift out. Under no circumstances should a pedestrian be inside the same trailer while a lift truck is either unloading or loading. The odds of crushing a pedestrian escalate greatly in confined spaces. Forklifts often fall off the edge of docks: This is a lethal type of accident. Don’t allow drivers to leave your dock without clearing them. Also, close doors as soon as the job is finished. Train and re-train your drivers about the dangers involved with this situation. Stacking loads is a common source of dock injuries: While safe load stacking is critical in all areas of an industrial operation, injuries are often incurred when shippers rush to manually palletize loads for outbound trucks. Don’t stack heavy loads atop light ones, or larger ones atop smaller ones. Once a pallet is finished, it should be checked for stability. Once satisfied, banding or shrink wrapping can help secure the pallet load. Be sure dock workers stay away from loaded pallets while they’re being handled by forklifts. Many injuries have occurred due to broken pallets.